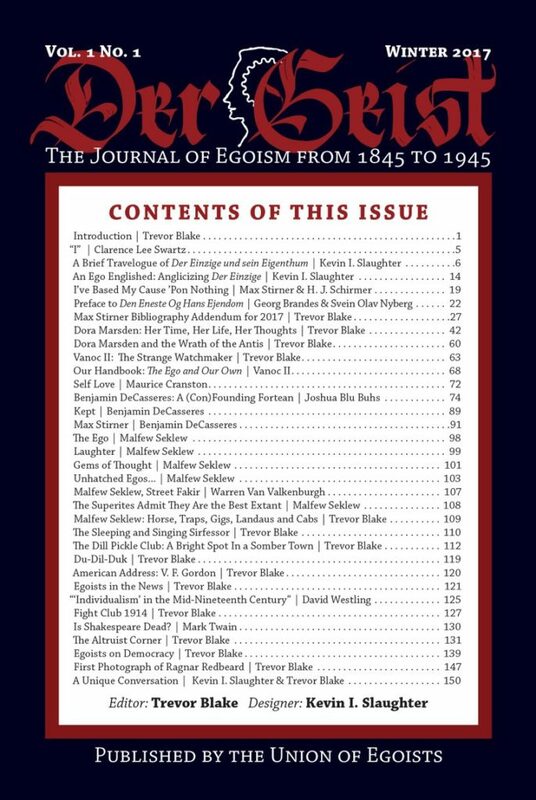 DER GEIST (Trevor Blake, editor) is an English-language journal for an international audience, publishing original scholarship on the philosophy of egoism. The journal is descriptive of the first century of egoism in print (from the 1845 publication of Der Einzige und sein Eigentum by Max Stirner to the end of 1945), not prescriptive in advocacy egoism. The inaugural issue includes an exclusive biography of Dora Marsden, lost essays by and about Malfew Seklew, and a newly discovered first photograph of Ragnar Redbeard. Scholarly interest in the egoism of Stirner, Marsden, Redbeard, Seklew and their peers (including Benjamin DeCasseres) has a new and unique home in DER GEIST. Liked it? Take a second to support dergeistjournal_sl1pyq on Patreon! Support Der Geist Journal on Patreon!